Crepes Are An Outstanding Dessert. 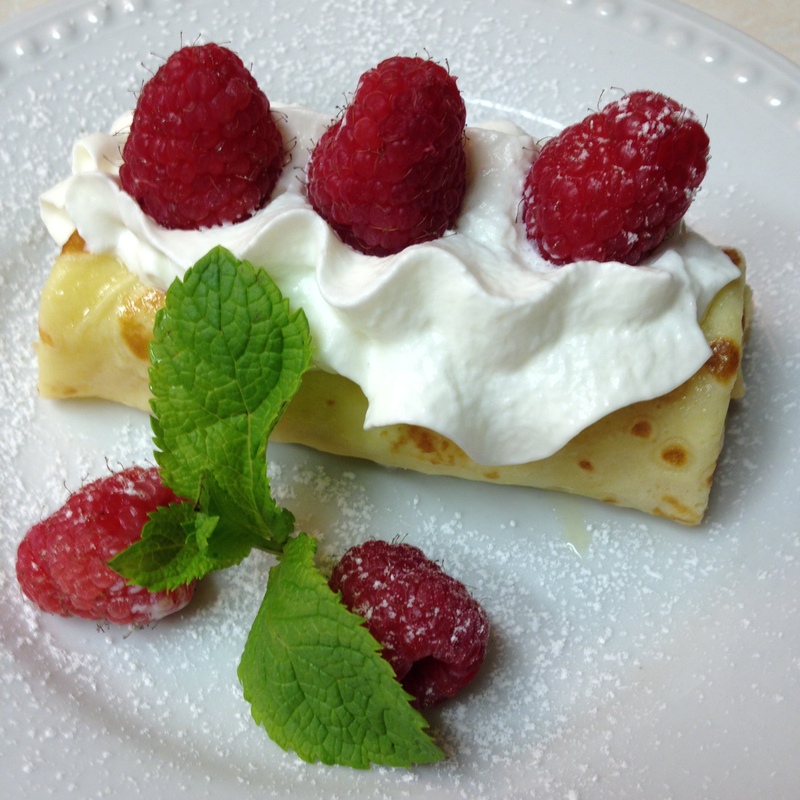 Simple Crepes For Amazing Desserts! We both love crepes! Harry likes his with Bananas and Nutella. Blasphemy! I like mine with lemon juice and sugar, the way they should be served! But we both agree that filling them with a velvety cream cheese filling and topping them with fresh seasonal fruit is never wrong! We love to make everything from scratch and share our recipes as you know, but we do rely on the skills and knowledge of a few really great cooks. For this recipe we like to use Martha Stewart’s Simple Crepe recipe. It works beautifully and tastes great. What’s not to love? We can’t improve on this one folks so trust us and try it for this or any other dish that calls for crepes. The recipe makes 12 crepes. Our filling recipe is enough for all 12. 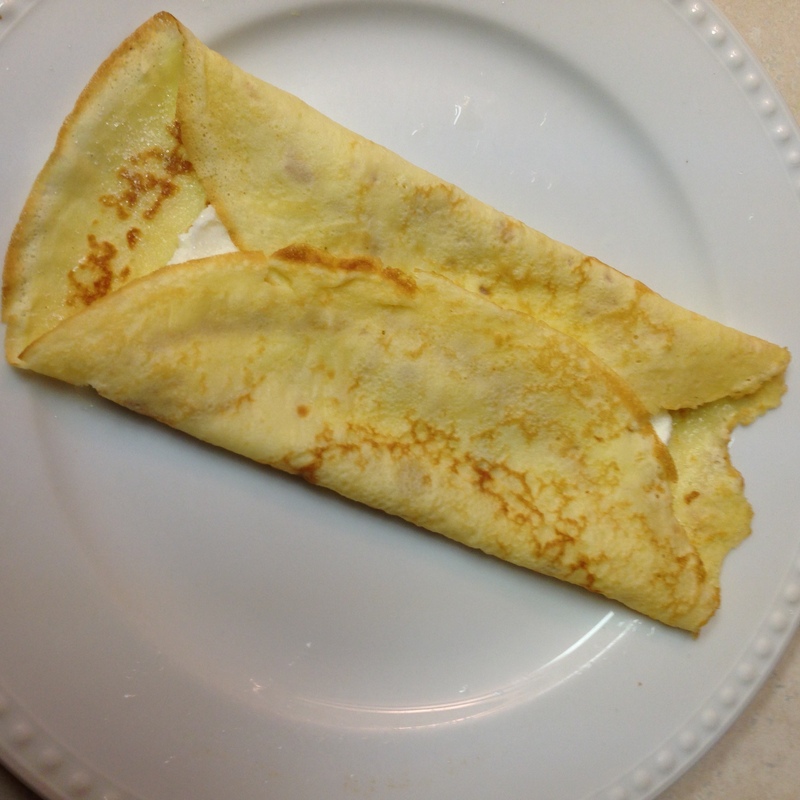 Harry was manning the crepe pan and he stacked the completed crepes between sheets of parchment so they don’t stick. You can let them cool, slide them into a zip-lock bag and freeze them at this point. It makes it so easy to create a professional dessert in no time once the crepes have been made. 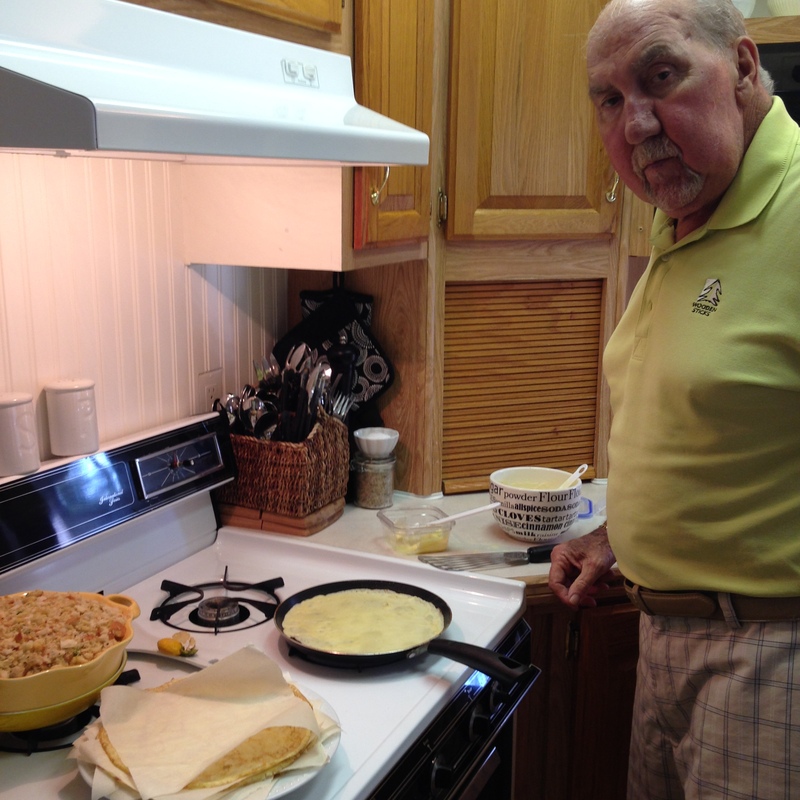 Cook’s Tip: You can leave out the sugar in the crepe recipe if you want to stuff them with a savory filling such as Asparagus with cheese sauce or Chicken a la King. Harry used an actual Crepe pan (a low sided non-stick pan) to make these but a good non-stick skillet about 10 inches in diameter can also be used. 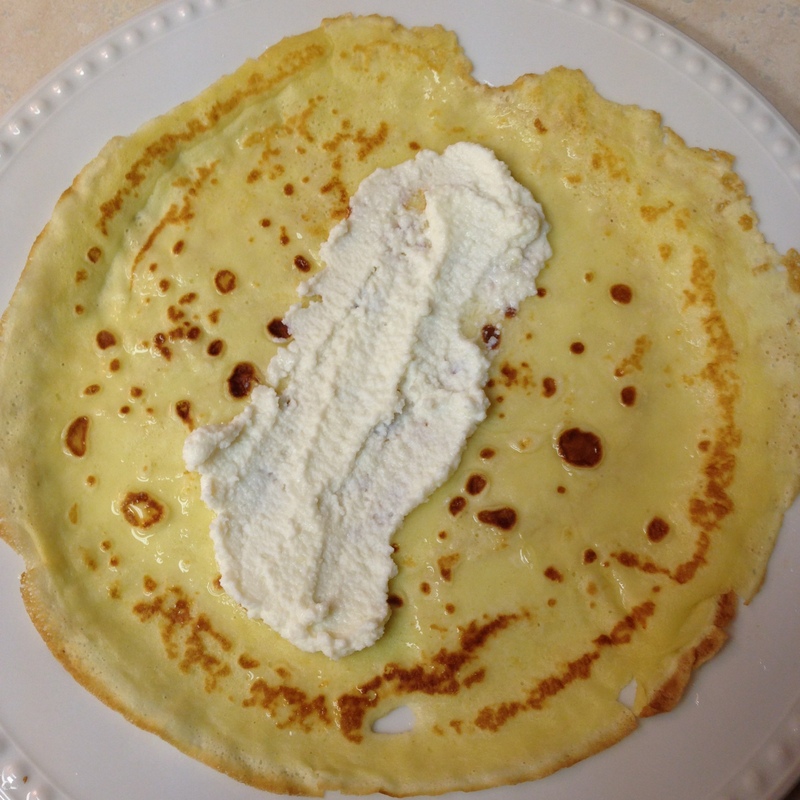 We made a lovely cream cheese filling for the crepes. It’s so easy we’re embarrassed to call it a recipe, but here goes. 1 brick, 8 oz cream cheese. Allow the cream cheese to soften at room temperature. Add all the other ingredients and beat until smooth. Once the crepes are cooled follow our photos for filling them. We used a pastry bag without a tip to pipe the filling onto the crepes, then flatten the cream cheese with a spoon before drizzling a bit of the reserved lemon juice (from the second lemon half) and a bit of sugar on the crepes before folding and rolling the crepes. Fold the crepes from the outside to the center to enclose the filing and roll them up gently. We said this dessert would look professional, didn’t we? Your guests will just love them. Here we used fresh raspberries and whipping cream with a dusting of icing sugar and a fresh mint sprig to complete our delicious dessert. Serve one or two crepes per person. If you have leftovers, go to the fridge at midnight and indulge your need, we certainly have!